… and commercial interests who want an arm and two legs. 1. Sharing knowledge – The Gronstedt Group begins tour of the SLENZ birthing unit. 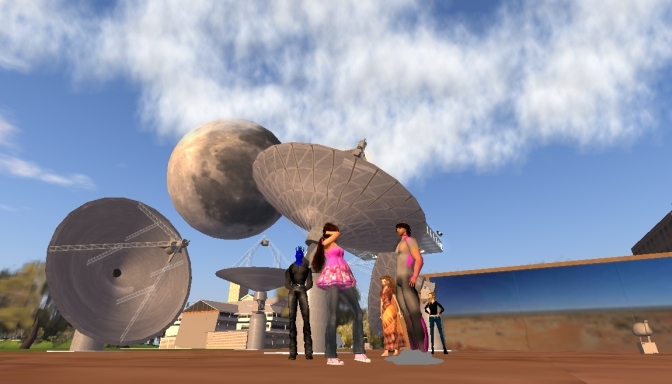 The more time I spend in Second Life and other virtual worlds the more I become convinced that SLENZ joint leader Dr Clare Atkins (SL: Arwenna Stardust) is right: Collaboration and sharing is the key to success in world education in virtual worlds. But its not just collaboration within the United States, or New Zealand. It’s collaboration around the world. The rich, big universities of North America and Europe might be able to afford to go it alone, but for the smaller and the often poorer tertiary institutions of the United States, countries like New Zealand, and Third World countries – if they even have reliable, affordable Broadband services – don’t have the luxury of NOT collaborating and sharing, both at an institutional level and at an academic level. The creation of complex builds, huds, animations and all the other paraphernalia of teaching successfully in a virtual world, as well as aquiring the skills/knowhow to use them can cost megabucks: to not share them under OpenSource and Creative Commons license with institutions and academics around the world would seem to be me to be both profligate and selfish. It also could regarded by some , particularly when sold at a high price or with an exorbitant license fee attached, as both neo-colonialist and greedy capitalism of the kind that brought about the most recent crash of world markets. The collaboration thoughts, although first ennunciated for me by Dr Atkins, were brought to mind more recently by five things: the move by the Lindens, admitted an avowedly commercial organisation, to promote Second Life behind the firewall, previously Nebraska, to commercial, Government and educational institutions at US$55,000 a pop, a princely sum for many cash-strapped institutions around the world; President Obama’s Cairo vision, proclaimed in June; a visit by the KiwiEd group to the University of Western Australia, Second Life site; a Train for Success Gronstedt Group 35-avatar tour of the SLENZ Project’s virtual birthing unit on the Second Life island of Kowhai; and finally, but not least, the one-hour keynote address on copyright by Harvard University Professor of Law Lawrence Lessig to EDUCAUSE09 in Denver earlier this month. 2. Sharing the knowledge: Lessig’s certificate of entitlement. The problem with his vision is that US commercial – and often Government – interests have almost always worked against facilitating collaboration and sharing across geographic and cultural boundaries. Look at Microsoft software. Look at Apple and ITunes licensing. Look at software regionalisation. Look at the record industry. Look at the book industry, where rich English language publishers in the UK and the US split the world into at least two markets. Look at the way copyright law has moved into education – and science. But its not a new phenomenon. Look at banana republics, created out of Boston, as a rather ironical and destructive facilitation of collaboration across geographic and cultural boundaries. On the other hand there are triumphs of reason over idiocy. Look at the rise of the ubiquitous PC, compared to the Apple computer, even though using a proprietary Operating System the rise from the “underground” of Moodle, compared to say Blackboard; the slow advance of bilateral free trade agreements, even if not the much desired mutilateral free trade agreements, instead of the trade siege mentality, which affected most of the world in the 1930s (and still threatens); the growing popularity of Linux compared to proprietary Operating Systems; and finally the astounding growth of Wikipedia compared to Encarta or Britannia. Despite my misgivings I have been heartened over the years by the surprising degree of co-operation and collaboration that has been happening in virtual worlds. That is despite the actions of those few Scrooge McDuck-like educational institutions which have purely commercial interests at heart and appear to run closed shop operations, sharing with none. I was even more cheered recently by a visit to the University of Western Australia when I found that university, which is in the forefront of Australian virtual world education, was entering into bi-lateral virtual “free trade” and/or “free exchange” agreements with the likes of Stanford University and others. This mirrors the agreements put in place by Scott Diener (SL: Professor Noarlunga) at the University of Auckland with the University of Boise; and Judy Cockeram (SL: Judy-Arx Scribe) and her work with architects around the world; and those “handshake” agreements or informal sharing arrangements put in place by a myriad of other relatively smaller institutions who have already recognised the benefits of world-wide collaboration. 3.Sharing the knowledge – KiwiEd group tours University of Wester Australia site. And then there is the SLENZ Project, which 18 months ago adopted as its ruling credo, complete transparency, with OpenSource under Creative Commons license for all its virtual educational products, developments and knowledge in the hope that others would be able to build on the team’s work. Even though the adoption of this credo was probably due more to the persistence and bloody-mindedness of a then non-Second Life “immersed” and relatively sceptical SLENZ Learning Designer Leigh Blackall than anything else, it has worked and is working. One has to agree now that Blackall was right, even though there is obviously a place for fair payment to commercial (virtual world creators, builders, developers etc) interests, something Linden Labs has recognised with its protection of its own virtual world product lines (and unfortunately those created and developed by its residents, even if Creative Commons, full permissions and OpenSource) behind the walls of Second Life. Linden Labs is not alone, however, in usurping user/creator rights. The way they have covered the issue in their rather draconian and very American Terms of Service is little different from other major US on-line social networking services: if you put it up on their service, they own it. Virtual World Free Trade/Exchange Pact? Like the tyrants behind the old Iron Curtain the Lindens realise that keeping control of their residents’ creations inside their world (and keeping them there), guarantees that they will have to stay there unless they want to pour their creativity, time and work down the drain and start a new virtual life elsewhere. This leads me to the thought that President Obama, although paying lip service to “collaboration across geographic and cultural boundaries,” needs to put his Government’s money where his mouth is and promote a world-wide free trade/exchange agreement for virtual world education if not for virtual worlds themselves, guaranteeing rights of both personal ownership of individual products when created or bought in a real world sense, but also opening up US educational institution virtual knowledge and creativity for the rest of the world to freely add to, and build on. The President has the vision for a better on-line world – which could lead to greater understanding between peoples through education. If he does nothing except talk. Nothing will happen. And, I believe, we will find the major educational institutions moving more behind their Ivy Walls – if they are not already there – and American educational institutions (and others in UK, Germany, Brazil etc) adopting a siege mentality even though virtual worlds (all virtual worlds, whether emanating out of the US or China or anywhere else) will only fulfill their true potential of levelling the playing field for all educationally if they are free and open to all. That is something America can do for the world – all worlds. 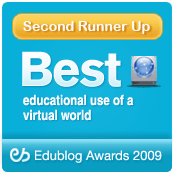 The Virtual Life Education New Zealand (VLENZ) blog (slenz.wordpress.com) is designed to provide an independent view of progress and technological/social developments in MUVEs (Multi-User Virtual Environments) in New Zealand and around the world with an emphasis on education. The blog is based on the personal experiences of and observations concerning MUVEs and MORPGs of the editor, John Waugh (SL: Johnnie Wendt) and, from time-to-time, guest editors/writers'. As a result it may not reflect the views of the VLENZ Group, individual VLENZ members and/or the Group's leadership, and/or the various tertiary institutions and other organisations connected to it, either directly or indirectly. The views expressed and posted are completely those of the named author of each article unless otherwise stated. Second Life® and Linden Lab® are registered trademarks of Linden Research, Inc. No infringement is intended.